My son absolutely loves this rug he has put quite a bit of wear and tear on it and it has held up great. I plan to purchase another since this rug would look great in any room. 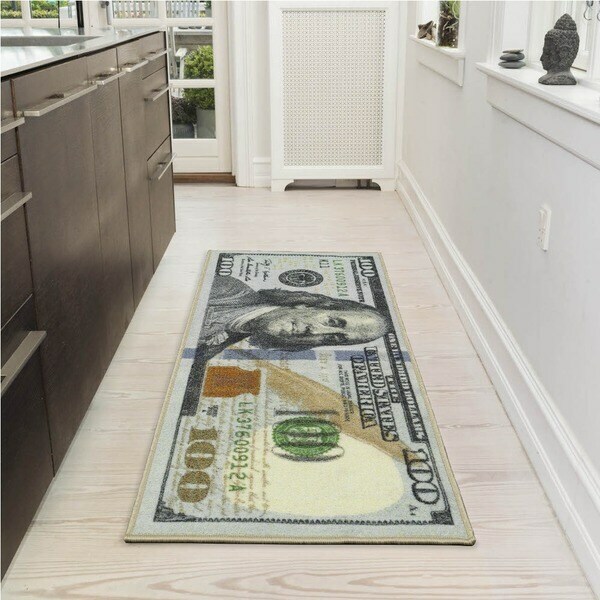 Add a touch of humor and fun to your home with this 100 dollar bill design runner rug. With non slip rubber backing, this runner is ideal for in your busy home or office and will be able to withstand the rigors of daily use by active kids and pets. Impress guests with a whimsical note! Tip: for common folds & curls: To lay your new rug flat faster, reverse-roll and set heavy objects on corners. Tip: Pair with our double-sided rug tape (sold separately). Dimensions 53.0 In. X 22.0 In. X 0.2 In. I am very pleased with my 100 dollar bill runner. As an Interior designer I look for unique items, this is a very unique item. My clients are always wondering what unique item I have added to my inventory. Money whether it is real or a replica it is always exciting. I've received much applause for the symbolism of having a $100 bill on a rug. You might not have a real $100 bill but you will always have yours that represents it.This replica of a $100 dollar bill gives much joy in the symbolism of the product. The image is very close to what a $100 bill looks like. I and my clients are very pleased. With the extra symbol that is put on the runner to symbolize the authenticity of a real $100 bill.The symbolism of having a $100 at all times is great. I love these rugs I am happy I purchased them I would recommend these to any one who does not have a color scheme. nice non skid rug, kitchy design good for a rug by the door or bath. great size. My son loves collecting coins and has a money theme in his bedroom so I purchased this rug to put alongside his bed. We have laminate wood flooring but this rug doesn’t slip because it has a non-skid rubber backing. You can’t beat the quality for the price. This Ottomanson Siesta collection 100 Dollar Bill Design Runner Rug only looks beautiful. it doesn't have that soft feel I was expecting in a rug. It would look lovely if you hang it on a wall. The service was very fast I gave it 3 stars because it is just average. Great colors and perfect fit for my space. I purchased these on a whim for my small and narrow kitchen. They give a whimsical look as they function perfectly. The rubber backing is a plus for the kitchen. Yes, I certainly do recommend this rug to anyone. I have never seen a runner like this and it is great! the colors and details are amazing. I don't have the heart to step on this so I am using it as a decorative piece of wall art. We will hang it for display, awesome value as well. Brilliant color and realistic look! Great gift (think new job, graduation birthday or new home) and a sure conversation starter. And, you don't need an over-sized wallet because this bill gets dropped on the floor. My son used this $100 fun rug in his bath rm for a BBQ gathering it was a great conversation piece.. I would recommend this rug to a friend. I got this for my son he loves it it's so him. Once I put it in place, it was thin and unattractive. I love these! I bought two for my son and two for me!! I’m getting more! Excellent quality! Great price! Really fun and whimsical rug. I put it in my teenage son‘s bathroom. great fun item, for the love of money It showes a lot of bling!! standard runner for my boyfriends man cave. he enjoyed it. Got it as a gift for my cousin. He said it adds a perfect touch to his bachelor pad! This has been quite the conversation piece and well worth the $20 or $20+ when it was on sale. You would think as much talk about it, question receive we paid a Benjamin to get a Benjamin mat! It’s in front of the wet bar. This could be good for a Bachelor pad, a college dorm (study hard, got to make that $, I am sure there are some clever ideas racing through heads now ... some of which we probably can’t write on the site). LOL! Get the rug if you think you need it. You won’t regret it. Heck if you’re on a sales team, make this an award! Show me the money! You can be the next Jerry McQuire!